I can't upload WMV to YouTube, who can help? Having trouble trying to upload WMV video to YouTube? Uploading WMV videos to YouTube shouldn’t seem difficult. It is very easy to upload WMV videos to YouTube. You can Upload WMV videos to YouTube easily with few steps. You can upload WMV videos to YouTube using special desktop software that is compatible with both Windows and macOS. Check through this article to know how to convert and upload WMV video file to YouTube using the desktop software tool. With the following guide, you should be able to upload WMV video to YouTube. Step 1: Sign in to your YouTube account. Enter your email address and password or any credentials that you use to access your YouTube account. Step 2: On YouTube page, click the “Upload “button. It directs you to choose a file to upload. Step 3: Tap on "Select file to upload" it leads you to the files in your computer. Pick on the WMV file that you want to upload. Step 4: Edit you video; enter the title and give its description in the description box. You can also put tags in for people to find your photo. Save changes after you done with it. Step 5: Choose the privacy settings. You can choose to edit the basic and advanced settings too. 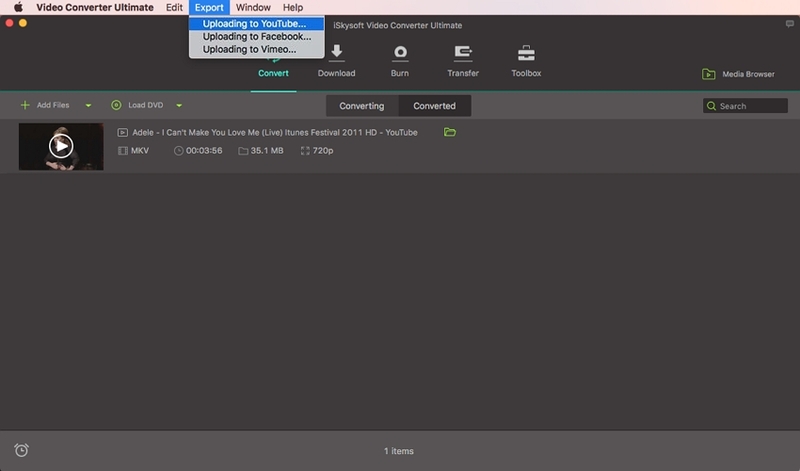 Step 6: Finally click the "Upload button" to finish uploading your WMV file. Where you selected private or unlisted settings, you need to click "Done" to complete the upload. 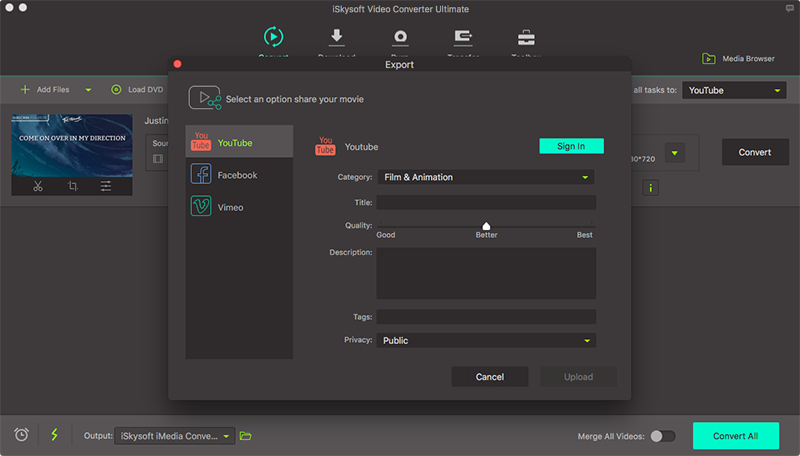 iSkysoft Video Converter Ultimate is a video converter software that enables you to upload video to YouTube with Ease. It supports from macOS 10.7 to 10.14 Mojave, and Windows 10/8/7/XP/Vista. It can convert media files to other different formats. 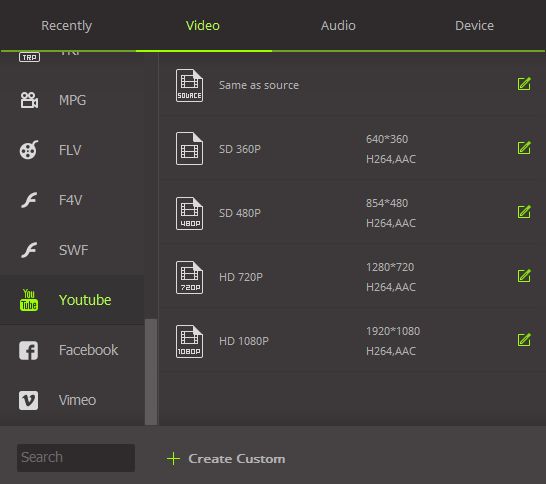 It can upload media files to YouTube, Vimeo and Facebook. It supports 150+ video/audio formats, including MP4, FLV, WMV, 3GP, M4V, MOV, RMVB, VOB, AC3, APE, WMA, MP3, M4A, AAC, etc. It converts media files quickly and maintains its original quality. It is can burn videos to DVD and convert Home DVD and backup DVD. It supports devices like HTC devices, Samsung devices, Game Hardware and Apple devices. iSkysoft Video Converter Ultimate for Mac helps to upload WMV videos to YouTube using the following steps. Drag the WMV video that you want to convert to the program Window. Next, hit the “Export” icon from the main menu. On the drop down list choose “Uploading to YouTube”. Afterward, you can choose to add description and title of the videos including other details. Lastly, tap on “Upload” button to export the video to YouTube and your videos will have been posted to YouTube. 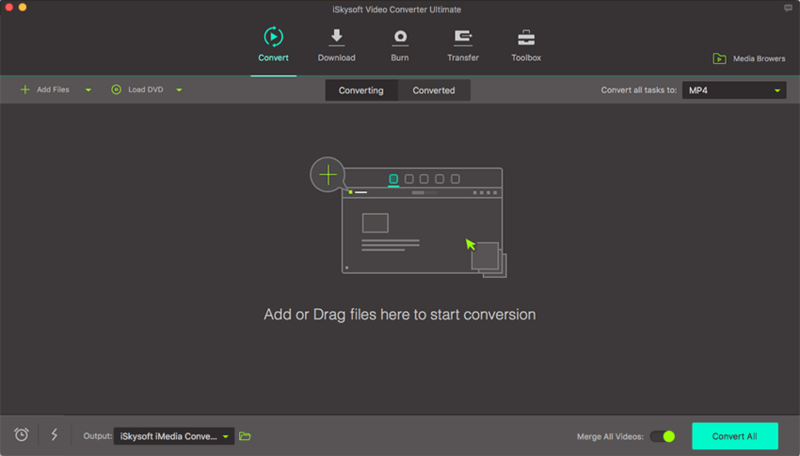 When using iSkysoft Video Converter Ultimate for Windows to upload WMV videos, you need to convert it first. Below is a guide on how to do it. First, import your WMV file to the program. Click on “Add Files” to import the file to iSkysoft Video Converter Ultimate program. Pick on the file that you want to upload. Next, you need to select YouTube format to make your video compatible for uploading to YouTube. Click on “Format” and below it select “Web” then Choose “YouTube Video”. Thereafter, click the “Convert” button to begin to convert your video to YouTube file. Your WMV video will convert and will be ready to be uploaded to YouTube. Next, enter your username and password to sign in to YouTube. Select the video privacy settings before uploading the video. On YouTube page, select "Upload" button then hit on “Select file to upload” icon. Pick on the converted YouTube video. Edit the basic and advanced settings the video is uploading. Finally, click the "Upload" or "Done" button to end the upload process depending on the privacy settings you chose.